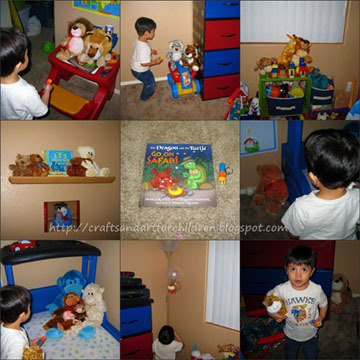 We read the book The Dragon and the Turtle Go On Safari by Donita K. Paul & Evangeline Denmark and did an activity to go along with the books theme. This is a cute story about 2 best friends, Padraig the dragon & Roger the turtle, who are pretending to be great adventurers and are determined to spend the whole night outside in their tent. The night starts out with them roasting marshmallows over a fire, but as the night goes on, they begin to hear scary noises. They hear a howler monkey, a giraffe, an elephant, and a rhino. Of course this is just their imagination as it is really an owl, a squirrel, a raccoon, and a dog! They finally fall asleep when a kitten-er-leopard wakes them with a loud screech. They think the baby leopard needs help and convince themselves to be courageous and rescue him. Bravely, the shine their flashlight everywhere looking for the leopard and find him in a tall tree. They work together to get him out of the tree and back to his mother. Padraig and Roger return to their tent and decide that they are ready to go home and try again another night. Just as they arrive home, the sun rises and they are super excited that they did last the whole night outdoors! I think this is a great story for 5-8 years old. I like that it teaches them that it’s okay to be scared, to work together as a team, and to use their imaginations. As a book-related activity, I set up my son’s little tent and chair. I read the book to him while he sat in his chair. 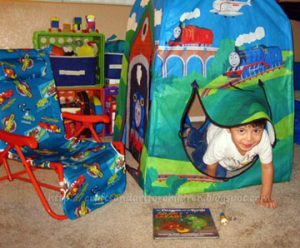 When I finished read the story, I had him go inside his tent while I placed his Jungle/Safari animals in various spots of his bedroom. Then, I turned off the light and give him his little flashlight (it shines red) for him to go on his own little safari adventure. He had fun finding all the different animals. He really surprised me when he found the baby leopard I hid in the tree (floor lamp) and said, “Momma, I have to save the baby leopard!” He bravely got the leopard down and gave him kisses. He’s so cute, he took the stuffed animal leopard with him everywhere for the rest of the night! 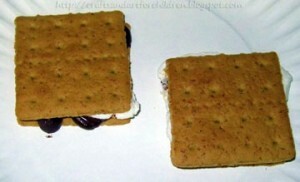 For a snack, we made smores…. yum! Like my review? Please rank it…. thank you!!! ***Disclaimer: I received this book for free from WaterBrook Multnomah Publishing Group for this review. Reading this book in a tent with snack would be wonderful.<br /><br />Thanks for linking to Read.Explore.Learn.